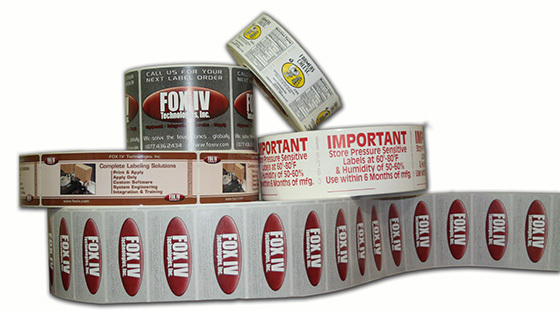 Colored blank labels, partially printed labels and fully printed labels are available through FOX IV’s label division. With seven flexographic printing presses, FOX IV can print up to 8-color process labels on a variety of label stocks for both secondary and primary labeling applications. Labels can be printed with UV curable or water-based inks, depending on your label requirements and are available in roll, sheet or fan-fold form. 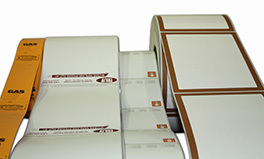 A large selection of label die sizes are on-hand to provide you with a range of label sizes. Additionally, FOX IV offers 100% inspection of our printed labels. Our on-press linear vision system inspects 100% of the entire label as opposed to automated loop vision systems which only inspect a sample of each label printed. FOX IV’s linear system immediately detects both continuous and random printing defects with its precision high-speed laser scanner. Don’t know what type of label you’ll need? Trust our label expert! 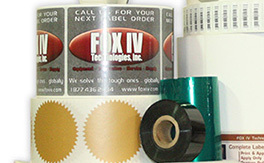 FOX IV can help you select the label stock, adhesive and form that is best for your application.